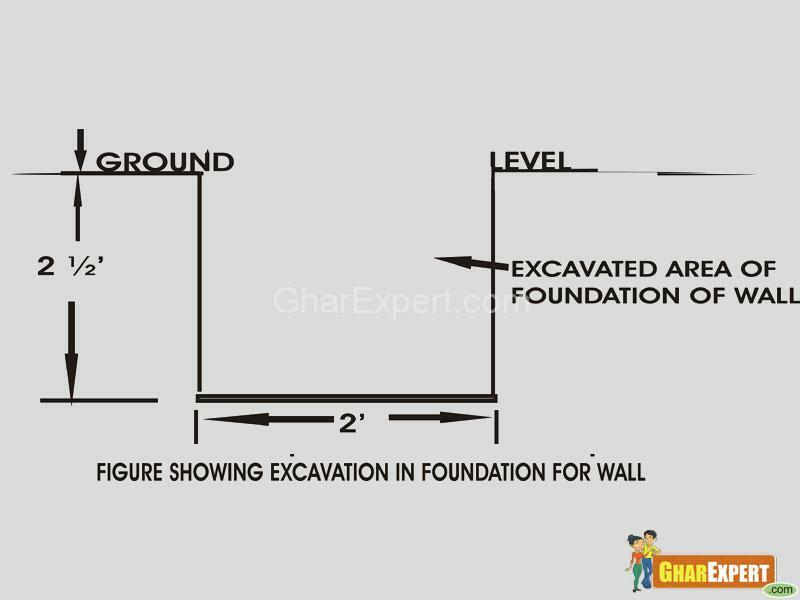 Foundation is the part of structure below plinth level up to the soil. It is in direct contact of soil and transmits load of super structure to soil. Generally it is below the ground level. 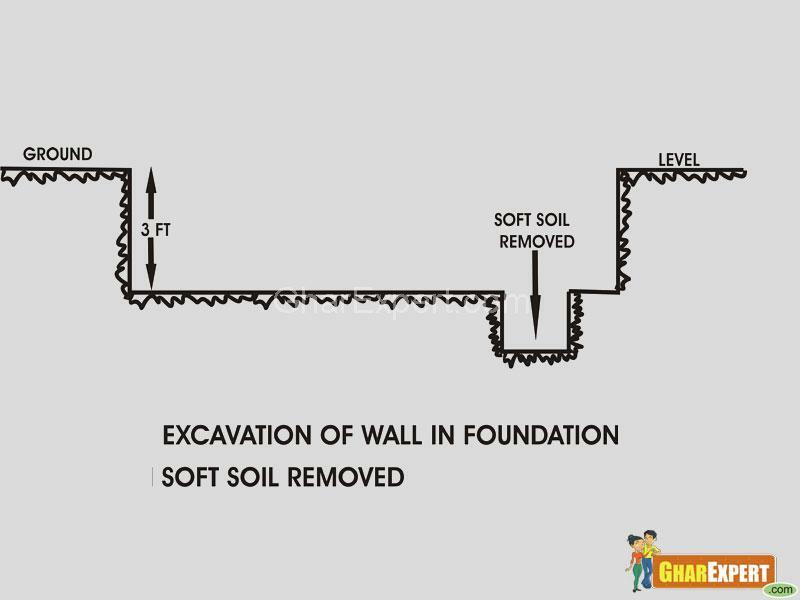 If some part of foundation is above ground level, it is also covered with earth filling. This portion of structure is not in contact of air, light etc, or to say that it is the hidden part of the structure. Depth of foundation depends on following factors. 2. Depth of shrinkage and swelling in case of clayey soils, due to seasonal changes which may cause appreciable movements. 3. Depth of frost penetration in case of fine sand and silt. 6. Practical minimum depth of foundation should not be less than 50 cm. to allow removal of top soil and variations in ground level. 7. Hence the best recommended depth of foundation is from 1.00 meter to 1.5 meter from original ground level. Footing is a structure constructed in brick work, masonry or concrete under the base of a wall or column for distributing the load over a large area. The width of footings should be laid according to structural design. 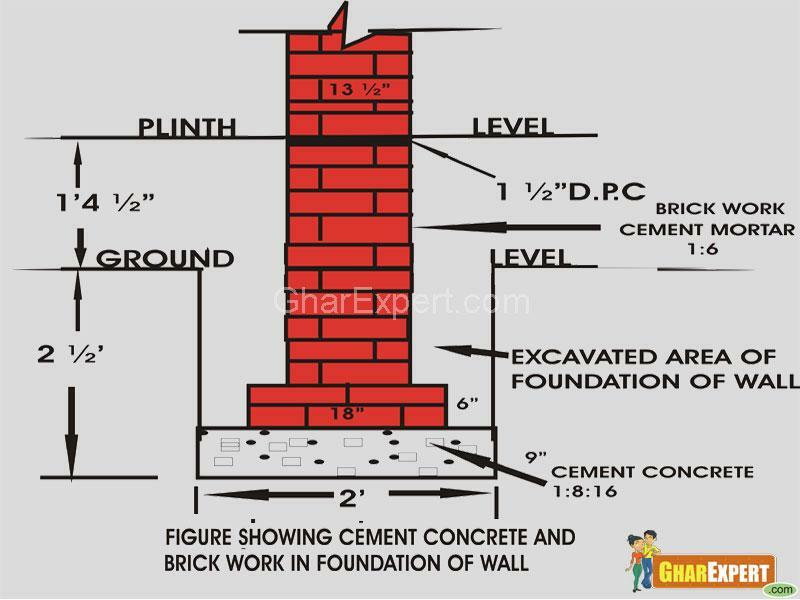 For light loaded buildings such as houses, flats, school buildings etc having not more than two storeys, the width of foundation is given below. 1. The width of footing should not be less than 75 cm for one brick thick wall. 2. The width of footing should not be less than 1 meter for one and half brick wall. The processes executed in the foundation works are given below. 1. Excavation of earth work in trenches for foundation. 2. Laying out cement concrete. 3. Laying the footing in case of raft or column construction. 4. Laying Anti termite treatment. 5. Laying Brick work up to plinth level. 6. Laying Damp proof course on the walls. 8. Refilling of earth in the building portion up to the required height according to plinth level. 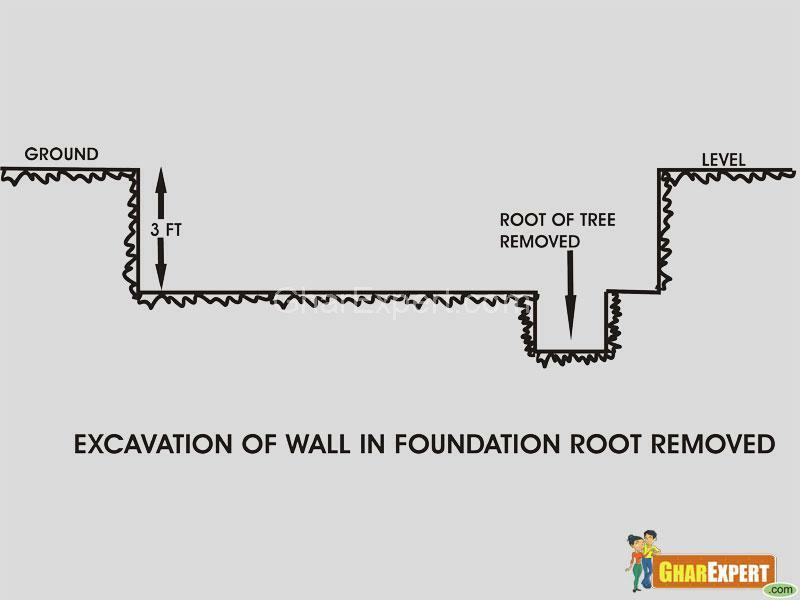 A foundation should be designed to transmit combined dead load, imposed load and wind load to the ground. Net loading intensity of pressure coming on the soil should not exceed the safe bearing capacity. Foundation should be designed in such a way that settlement to the ground is limited and uniform under whole of the building to avoid damage to the structure. Whole design of the foundation, super structure and characteristics of the ground should be studied to obtain economy in construction work. 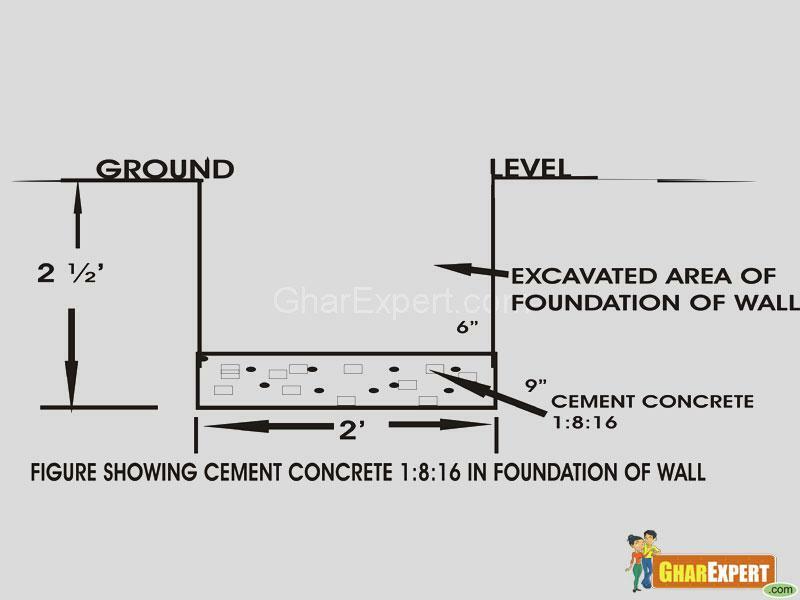 The cement concrete 1:8:16 is generally used in the foundation of walls in construction work. In case of column raft cement concrete 1:4:8 is the best recommended ratio for it in the foundation. For brick masonry cement mortar 1:4 to 1:6 is used as loading condition. 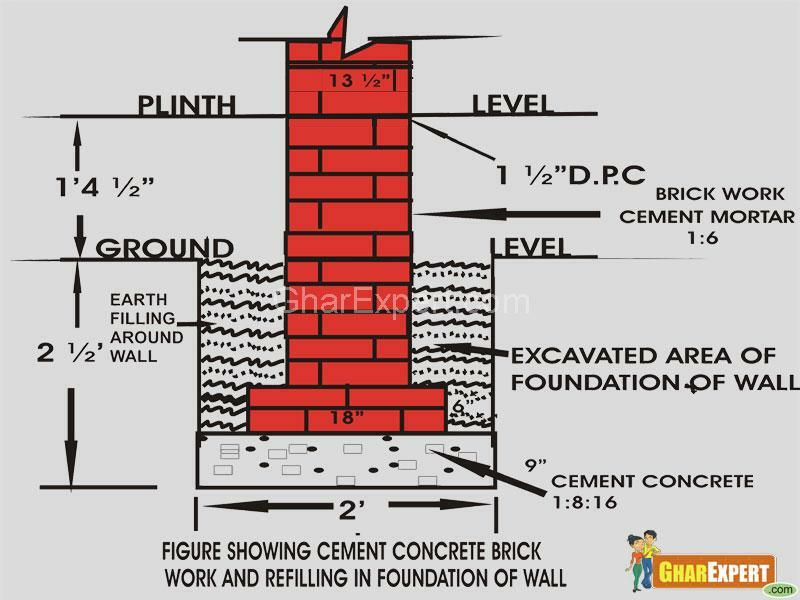 In case of column and raft footings up to plinth level cement concrete 1:2:4 or 1:1.5:3 are used. Dry coarse and well graded dense sand have maximum shear resistance and maximum bearing capacity. In general submerged soil and clay have less bearing capacity. 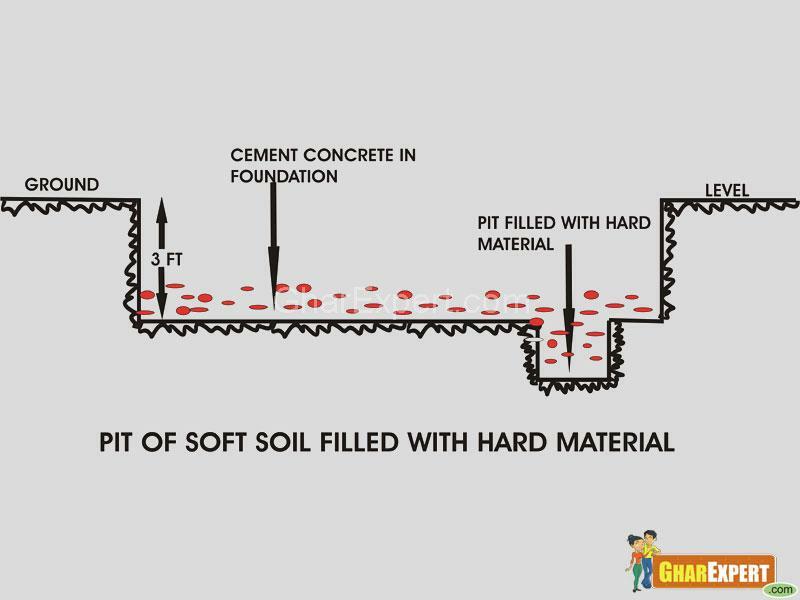 The depth and width of foundation should be according to structural design. The depth of the foundation should not be less than 1 meter in case the design is not available. 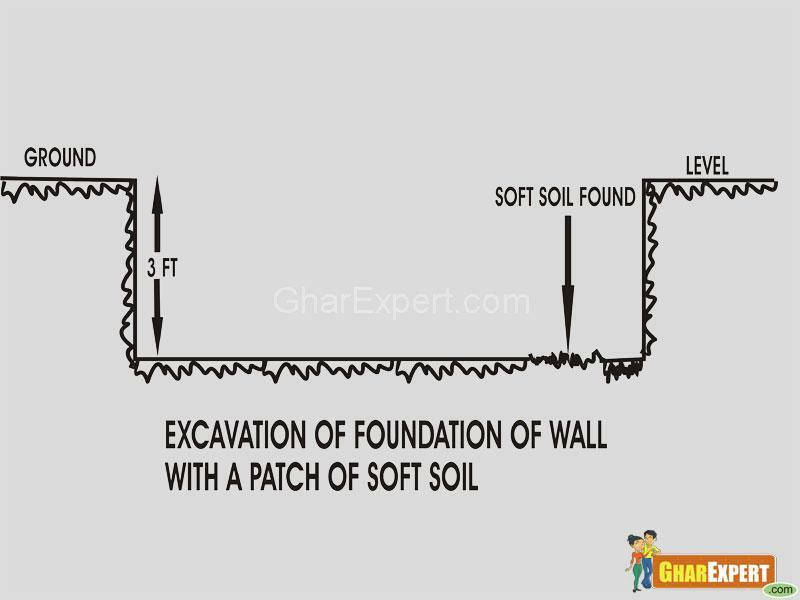 The length, width and depth of excavation should be checked with the help of center line and level marked on the burjis. The excavated material/ earth should be dumped at a distance of 1 meter from the edges. Arrangement of water pump should be made for pumping out rain water. The bottom layer of the foundation should be compacted. 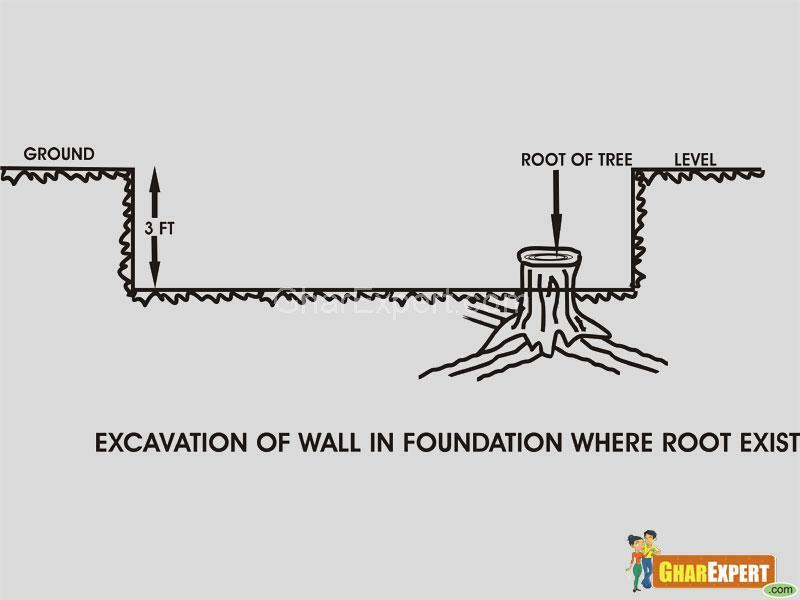 There should be no soft places in foundation due to roots etc.